Earlier this week, news from across the UK exploded when video footage from inside a halal slaughterhouse in Yorkshire, England was released by Animal Aid, an animal rights organization that secretly taped workers over a period of three days. What the group filmed is shocking: video shows slaughterhouse workers outright abusing the plant’s sheep, kicking them, lifting them up and throwing them across the room, and taunting them with knives, among other practices that are all in direct opposition to Islamic laws governing halal slaughter. The inflammatory footage has served to reignite a debate that has been raging in Europe for years, one that questions whether or not halal slaughter is humane. In both the US and in many European countries including France and England, conventional slaughterhouses are required by law to stun animals before killing them, resulting in a death that’s been widely proven to be more humane. But in these countries, halal as well as kosher slaughterhouses are exempt from that law, free to kill animals according to religious rites. Although many halal slaughterhouses do indeed use stunning, an increasing number of them don’t: A recent study by the British Veterinary Association showed that last year, halal and kosher slaughterhouses in the UK killed 2.4 million sheep and goats without stunning them first. Reaction to the the video footage out of Yorkshire has largely focused on the stun- or no-stun debate: an online petition asking the UK government to ban all slaughter without pre-stunning has garnered more than 110,000 signatures. 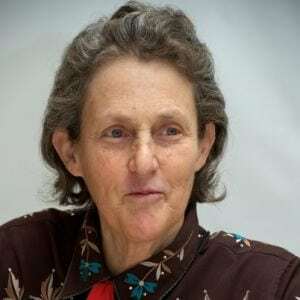 But as Dr. Temple Grandin—a leading autism advocate as well as one of the world’s foremost animal behavior experts—told MUNCHIES, that focus largely misses the point. Grandin points out that such flagrant abuse—“it sounds very sloppy and rough and not acceptable,” she says of the plant’s treatment of its animals—could, and does, occur in any number of under-supervised, poorly managed slaughterhouses, whether they employ pre-stunning or not. Grandin works as a consultant to the livestock industry and has designed slaughterhouses equipped with features that help minimize animals’ stress prior to slaughter. Her travels to inspect abattoirs have taken her all over the world, including to the UK, where she says she has toured clean, safe, and humane slaughterhouses, including halal facilities. But there’s always an exception to the rule, she says. “There are certain workers that just should not be handling animals.” Britain’s Food Standards Agency is currently investigating the Yorkshire plant, and at least one employee has already been fired. One thing the debate over Animal Aid’s footage has gotten right, Grandin says, is the group’s insistence that all UK slaughterhouses be equipped with closed-circuit televisions, to help ensure that operations are safe, legal, and humane. “I am a big promoter of that,” she says, adding that several of the big meat companies she has consulted with—including Cargill and JBS—already employ such systems. They’re monitored, Grandin says, by a third-party company, Arrowsight, based in Huntsville, Alabama. “At random intervals throughout the day, they tune into the different plants.” This oversight, Grandin says, helps make sure that slaughterhouse employees adhere to the rules—or else face the music. “This has resulted in workers being fired,” she says. For the most part, though, activity in the videotaped plants is by the books, Grandin says. The tape is often so innocuous, Grandin says, that she believes the public should have access to it. “I’d like to see some of this footage streamed out to the plants’ web pages,” she says.